When it comes to your hair finding the right product may be difficult to find. It's either it dries your hair, causes breakage or just downright NOT FOR YOU! 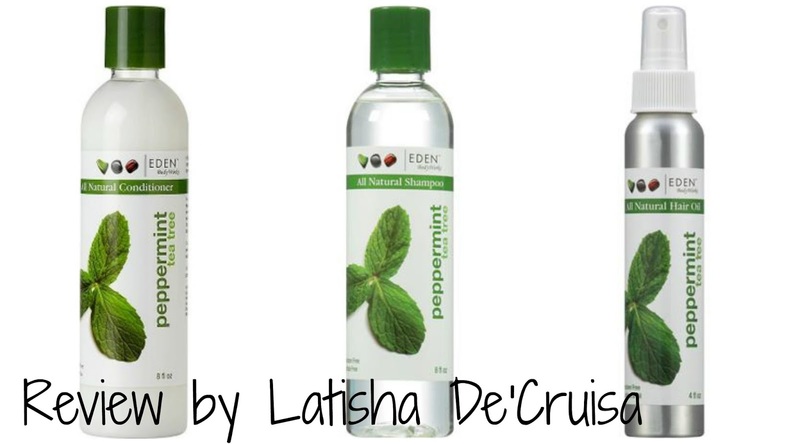 Well I hope you all try these 3 products that I'm talking about, they are Eden BodyWorks Peppermint Shampoo & Conditioner and Peppermint Tea Tree Hair Oil. EdenBodyWorks was created by 11 year old Jasmine Lawrence(now 13) after her hair was badly damaged she then began researching natural products that would nuture her with no luck she decided to go into her kitchen and create her own solution and that is how Eden BodyWorks began. I would love to personally that Jasmine before using my hair would be very flaky which is a bad look for any body. Just like Jasmine I looked around for different products that could solve my hair needs, I also had no luck. One night while in walmart on my search for my hair solution I began looking at famously known hair products and reading the ingredients and what I found was they all contained alcohol now upon reading I remember a conversation I had with a close friend that alcohol dries your hair out. Remember that, I put all those down and begin my search again and that's when I saw EDEN. The All Natural wording caught my attention and once I read the label and saw no alcohol was used I was sold. I purchased the Peppermint Tea Tree Shampoo & Conditioner for $8.47 & Tea Tree Hair Oil for $9.47. The Peppermint Shampoo is invigorating yet gentle and increases scalp circulation for a refreshed and renewed feeling. It is also specially formulated to help alleviate dry, flaking scalps with the use of pure peppermint botanicals. It pampers your hair without the use of harsh detergents or chemicals. The Peppermint Conditioner is a custom formulation of essential oils to help strengthen and grow hair. The super moisturizing conditioner blends sweet almond oil to seal in moisture, organic aloe, castor oil and chamomile to condition, and peppermint and tea tree essential oils to stimulate and treat. Penetrating your hair from root to tip, it leaves your hair more manageable and with lots of body. The Tea Tree Hair Oil is an exotic blend of nourishing ingredients that penetrates the hair root to promote new hair growth. The unique formula strengthens the hair to prevent breakage, leaving it silky and full of shine. If you been looking for a poduct that serves you great hair results, Choose EdenBodyWorks your hair will thank you! EdenBodyWorks was made without sulfates and contains no mineral oils (petroleum), dyes or parabens and is cruelty free.